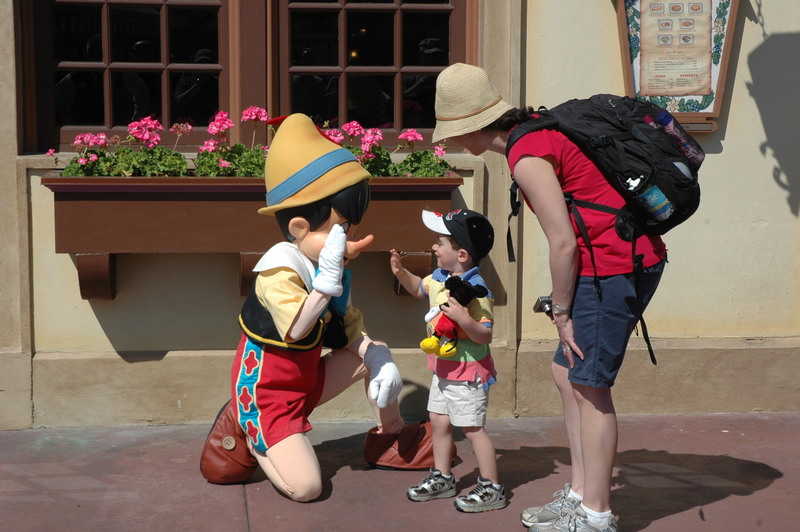 We took the kids to Disney World in March for NIcholas’ sixth birthday. If you have the opportunity to do a kid’s birthday in Disney World, I highly recommend it. Below is the third part in a series of each day of our adventure. You can see the other posts here. Day Three of our Disney World adventure was a big day for everyone. To start, it was Nicholas’ sixth birthday, which was why we chose the weekend we chose to go. To make his birthday even more insane, it was also the first day we took advantage of Disney’s VIP Tour Guide service. Again, Nicholas and I were up and dressed first, so when Tommy got up, they immediately began playing and fooling around. But we were on a schedule, so in order to expedite, Nicholas and I got out of Dodge and went for a walk while Katie and Tommy got ready. 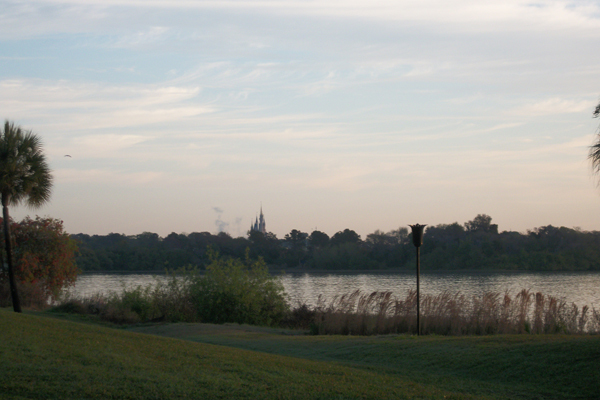 Early morning at the Polynesian is gorgeous. Nicholas and I wandered down by the beach and enjoyed the cool calm before the madness began. Nicholas enjoyed shooting the scenery, and I enjoyed watching him do it. Little Man’s six, and that’s awesome. We eventually headed back to the room and Katie and Tommy were ready to roll, so we headed over to Captain Cook’s (the cheap restaurant at the Polynesian) for a quick breakfast of Tonga Toast (I want to go to there!) and Mickey waffles. With our coffees filled and ready to roll, we headed outside to meet our guide. Now, most people don’t know about the Disney VIP Tour Guides program, and I didn’t either until my brother and his family went to Disney World last year and tried this out and told me about it. The website indicates that their “team of vacation planning professionals customizes your vacation so you can spend your time playing, not planning”. Your guide is a guest services cast member who knows the ins and outs of the parks, the best way to get from point A to point Q, and can get you priority seating for parades and other events. My brother raved about it, saying he’d never do Disney World again without it, so I figured we’d give it a shot. Our guide’s name was Hastings and he presented Nicholas and Tommy with their very own plush Mickeys, as well as an extra Donald Duck for Nicholas since it was his birthday. He showed us to his Suburban, we climbed inside and we headed to the Magic Kingdom. Since the park had just opened, we were already ahead of the crowds and we quickly headed over to Adventure Land to ride the Magic Carpets. Nicholas enjoyed that and rode twice, once with me and once with Katie, while Tommy almost went on the second time, but then opted out at the last minute. We headed from there over to Pirates of the Caribbean, which scared both of the kids a little bit, but Nicholas warmed up to it; Tommy wasn’t too into it. In his defense, Pirates has gotten darker and gloomier since the movies came out, so it was a little crazy. To lighten things up a bit, we headed over to It’s a Small World. Tommy was a little gun shy after the last boat ride attraction, but he decided by the end that he liked it and wanted to go again. So we went again. Next up was the Teacups, but when we got there there were a few workmen working on it and they couldn’t tell us when it would be back up, so I think we then moved on to Winnie the Pooh. This scared Tommy a bit on Thursday, so he didn’t want to go on with us, so Nicholas, Hastings and I went on and had a blast. Nicholas loves the bouncing Tigger part. We headed over to check out Peter Pan’s Flight, but that was “101” (closed). Hastings informed me that the usual cause of a ride closure is what they term a “protein spill” (someone threw up). Since they can’t clean the ride while it’s running, they need to evacuate everyone from the ride, close the whole thing down, turn the lights on and get cleaning. 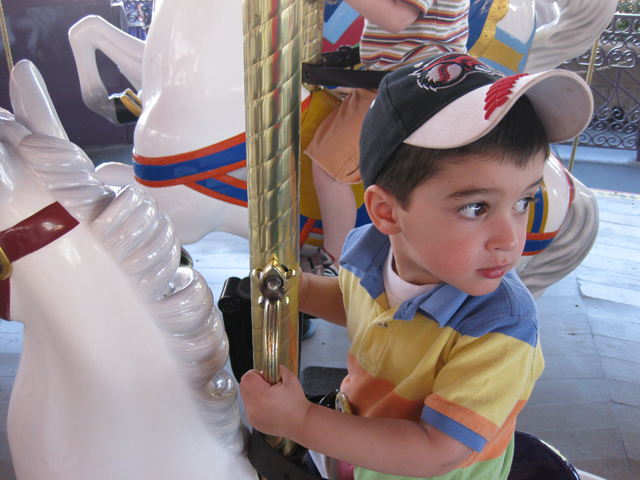 Instead, we hit the Carousel (Tommy’s favorite ride anywhere in the world) and rode that twice. I think, while we were on the carousel, Hastings ran over to the teacups to see if they were running again, and they were, so we went over that way to hop on board. Tommy really wanted to go on the tea cups, but when we finally got there, he decided he didn’t, so just Nicholas and I went. Phew! We got through that stuff by about 11:30 or so. We entered Tomorrow Land to check out the TomorrowLand Speedway. This was one of my favorites as a kid, and the boys loved it. After our race, we grabbed ice cream and rested for a few. We actually skipped lunch on this day so as to maximize our time with Hastings, so the kids snacked throughout the day. On our way to the bathroom, a trash can rolled up to Nicholas and sang him Happy Birthday. Up next was Buzz Lightyear’s Space Ranger Spin. This ride was pretty cool, where you shoot lasers at little targets as you zoom through space. The boys loved that as well, so we rode twice and then moved on to a relaxing cruise on the Wedway People Mover (I’ll never call it the TomorrowLand Transit Authority People Mover). The PeopleMover goes through the side of Space Mountain which is always cool. 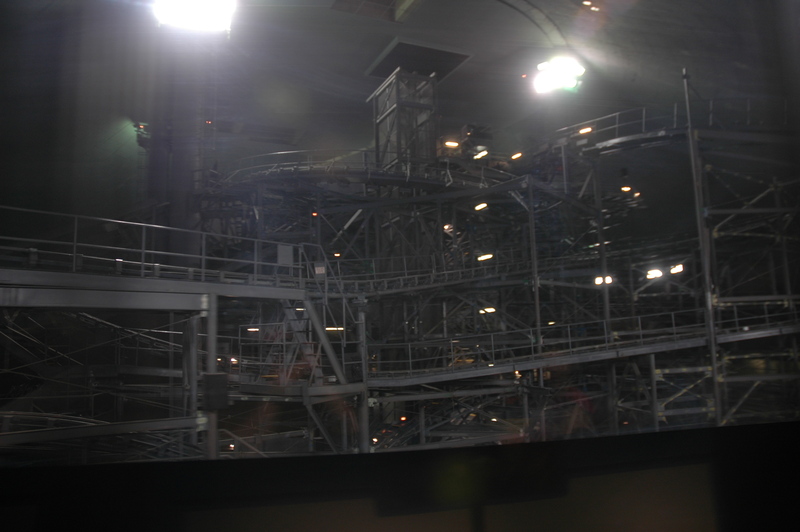 This time, Space Mountain was closed and the lights were on inside, so we got to see the whole superstructure inside. Pretty cool, actually! To close the rest of the day out, we headed back over to Adventure Land to ride the Jungle Cruise. The kids enjoyed this since it’s so mellow and fun, and it was another nice rest. Once we finished here, the plan was to finish the day out on Splash Mountain (the big log flume). I love log flumes, and I figured Nicholas would really enjoy it as well. Tommy was too small to go, so he and Katie went to a meeting spot to grab a snack and hang while we rode Splash Mountain. Nicholas was stoked to ride until we were literally in the little queue area where you’ll get into your log, at which point he said “I don’t want to go!” I told him we couldn’t back out now, and that the only way down was on the ride, so he got on, but he was freaked out. “It’s too dark!”, “It’s too steep!”. And then we finally made it to the 50′ drop at the end and we got soaked and he was pissed. Talking to him now a few weeks later, he said he really liked it, but that he was just scared that he was going to fall out on the big drop. I think he’ll dig it next time we go. We met Katie and Tommy over by Liberty Square and grabbed a quick hot dog. Nicholas was grumpy, Tommy was sleeping, and it was just about time to head out anyway, so we opted to do that. Hastings guided us back toward Tomorrow Land as we avoided the 3:00 parade, we exited out a door marked “Cast Members Only”, and we drove back to the hotel. Since we had him booked again for the next day, we decided on 9:00 again the following morning and we went our separate ways. Now, we did a ton of stuff in six hours in the Magic Kingdom on what was deemed by the guide blogs as a busy day at the Kingdom, so we were all pretty beat. But we weren’t done yet! 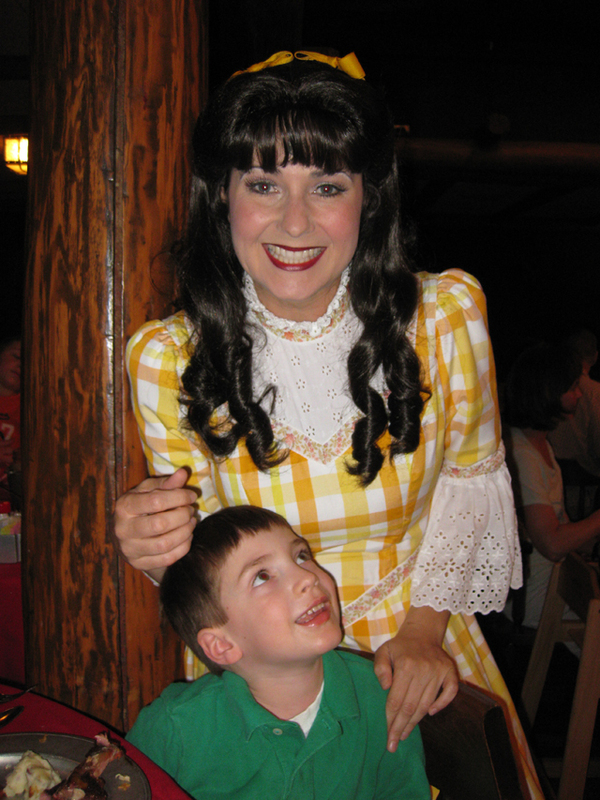 Now it was time to get ready to get over to Fort Wilderness for the Hoop Dee Doo Revue. We had tickets for the 5:00 show and they ask you to get over there 30 minutes ahead of time. We called the front-desk and they said it could take an hour to get there by the time you catch the ferries, etc, which means leaving by 3:30. We looked at our watches and it was 3:45 so we freaked out. We got dressed super quick and high-tailed it over to the dock to catch the ferry to the Magic Kingdom, in order to transfer to the Fort Wilderness ferry. We just missed the MK ferry, so we waited for a bit before deciding to head up to the monorail and go that way to the MK. We only wound up having to wait for about 5 minutes for the ferry to come, so we wound up being in pretty good shape. We arrived at Pioneer Hall and waited in a short line before heading in and being seated. The Hoop Dee Doo is a good old time: All-you-can-eat salad, fried chicken, ribs, potatoes and vegetables served up in metal buckets; unlimited Bud Light in frosty mason jars; old-timey singing and dancing, and a fair amount of hooting and hollering. One of the Pioneer Hall Players sang Happy Birthday to Nicholas, and a good time was had by all. Tommy even played the washboard! Before we knew it, the show (and our strawberry shortcake) was coming to an end. After a half hour or so of the kids playing on the playground at Fort Wilderness, it was time to head back to the ranch. We opted to take the resort ferry back to to the Contemporary, and then take the monorail back to the Poly from there. The line was much shorter, and the journey was considerably quicker. Once again, all were sufficiently exhausted, and we were all in bed before 9:00, almost too tired to consider the craziness that was in store for the following day.